I got up from my desk and walked to Wisconsin. Wind gusts from the south, across flat white ice. Frozen face. The dog ranged and roam ahead and to the side. We crossed three islands, three channels. Quiet courses. Then we arrived at the main channel, the river itself. Ice setting down between banks six feet high. A few blown-over snowmobile tracks. Little snow, easy walking, we didn’t want to turn around. White ground and gray tree trunks, a pale sky above. Nothing else to see except the solitude. Across the channel, up the other bank, objective reached. But there through the trees, the vast expanse of Rice Lake. Walk across the island, past a giant silver maple, stand on the shore. The delta of a significant tributary spreads out into the valley. Square miles of grass and water and snow. A friend’s new place concealed at the foot of that bluff. A walk for another day, a float for another season. Turn west again and follow footsteps back through monotony. Back at the office again, now my brow sweaty. My heart pumping harder, pushing winter blood. The dog lays down, chickadees flutter at the feeder. 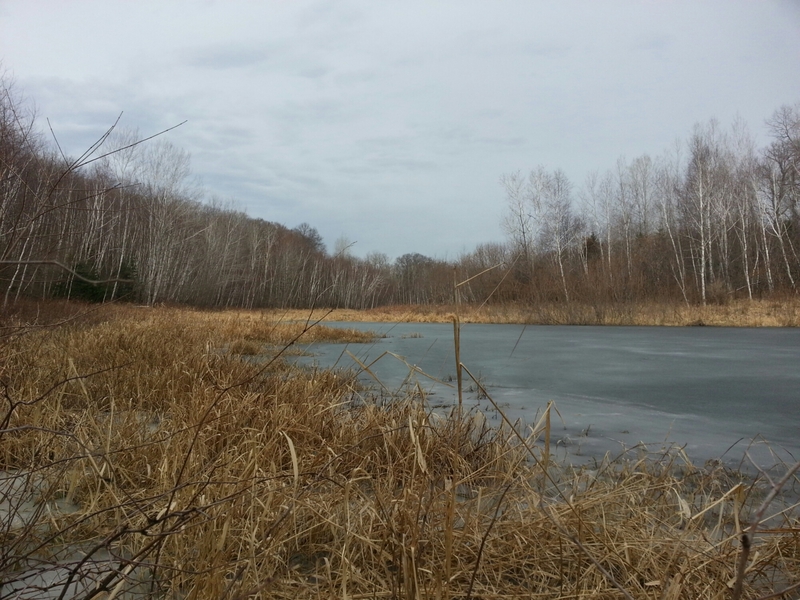 To help build a connection to this project locally and globally, the Phipps and its partners, including the Saint Croix National Scenic Riverway and the St. Croix Valley Foundation, will launch a website at www. artbenchtrail.org. The website will show pictures of each of the benches, give a map of the trail and more information about the stops on the trail. In addition, the website will feature in-depth narratives about the pieces, crafted by local writer and nature lover Greg Seitz. In creating these narratives, Seitz stays true to both the sense of place and the uniqueness of the arts. Seitz continues, “Two limestone pillars stand seven feet above the bench’s surface. They represent the Apple, Martell says, and its towering bluffs. A winding ribbon of blue flows across the bench’s surface, representing the meandering St. Croix. This blending of past and present is central to the identity of the St. Croix Valley. It is both the benches and Seitz’s narratives that work together to illustrate this. Oneota pot found near La Crosse, Wisconsin could hold 15 to 20 gallons, with walls that were one-third of an inch thick. All thanks to clam shells. It was a half winter, half autumn day last week when I joined a friend on a hike along the Ice Age National Scenic Trail where it passes through Straight Lake State Park. We met at a friendly café in Lucky, Wisconsin and drove a few miles out of town to the trailhead, where we found the woods and parking lot covered in light snow, which had fallen a few days before. We wound through the hardwood forests for a short while, passing by a 10-foot high boulder next to the trail, indicating the glacial nature of this path. Such boulders are a common sight throughout our region: A glacial erratic, it was carried here by glaciers and dropped as they melted. The Ice Age Trail follows roughly the edge of where the glaciers reached into Wisconsin during the last Ice Age. Later, I learned that Straight Lake State Park is shaped by a rare and significant glacial event. More on that in a bit. When we emerged at the west end of Straight Lake, the sun was dipping toward the horizon. A stand of tamaracks in the boggy area next to the lake glowed orange as only tamaracks can glow in fall. Straight Lake is easy on the eyes. One tiny island juts out of its middle, no more than 50 feet across and topped with bushy white pines. Ridges rise up from both sides of the lake, covered in oak and other hardwoods. On the other end, a clump of nice pines on a point stood out in their greenery. As we walked along the north shore of the lake, the narrow path soon joined the historic Clam Falls Trail, a historic road which once carried settlers and loggers from St. Croix Falls to Cumberland. According to the Luck Historical Society, one story of how the town got its name is that travelers on the trail were said to be “in Luck” if they made it there in one day from St. Croix Falls. From there, they would have followed the trail, including the section we now trod on, to Cumberland and Spooner, many of them looking for jobs in the logging camps and mills. Our route continued along the lake to where the Straight River pours out of it over an old dam which is basically a pile of rocks. We hopped across on stepping stones, much like people do at the headwaters of the Mississippi in Minnesota’s Itasca State Park. When we reached the pines at the east end of the lake, we followed the trail a little farther to Rainbow Lake, where the contrast between the north shore – orange, brown, and autumn – stood in stark contrast to the south shore – which was white and wintry. Cutting over a ridge, we came to the Straight River where it flows down its valley. This is where it is said one can witness a significant glacial feature. A “tunnel channel” forms the valley which contains Straight and Rainbow Lakes and the Straight River. According to the Wisconsin Department of Natural Resources, a tunnel channel is created when “meltwater erodes sediment and/or bedrock beneath the glacier.” Later, the river under the glacier moved slow enough to deposit a ridge of sandy sediment, creating an esker down the middle of the valley. The sun sets early these days so we were soon our way back through the dimming woods. Straight Lake State Park is known for its solitude and beauty, but it was also a unique experience to follow both a logging-era road and a glacial channel. I first heard about the park from Gregg Westigard of the Inter-County Leader at one of the Heritage Discovery Workshops last year, and was glad to finally make it here and experience the stories it has to tell for myself.